For more information about this event, please contact Carnaval de Québec at bonhomme@carnaval.qc.ca. Have you ever dreamed of creating your own ice sculpture? The Quebec Winter Carnival has just what you're looking for! Bring your group to our Ice Sculpture Workshops under the guidance of a team led by none other than Marc Lepire, chief sculptor of Bonhomme’s Ice Palace! 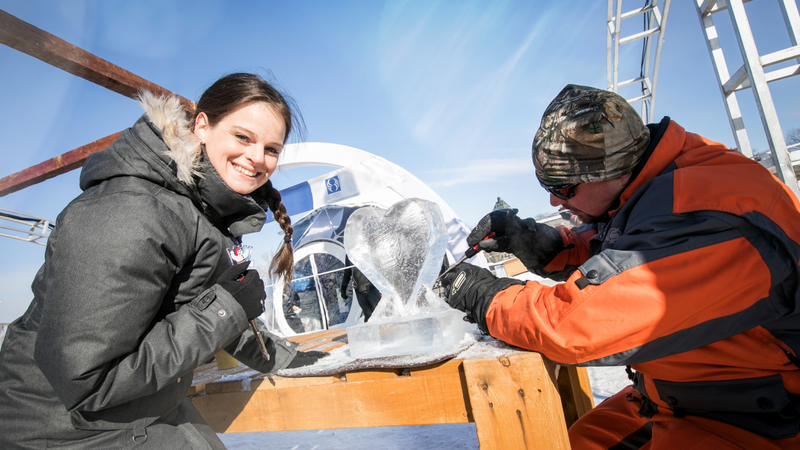 During this one-hour event, you will learn the workflow of master sculptors and enjoy the unique experience of carving your own solid ice block with your group of 2 to 4 people. Free all-you-can-drink hot chocolate will keep you warm throughout the frosty fun. When: On Saturdays and Sundays throughout the Carnival, from noon to 1 p.m., from 1:30 p.m. to 2:30 p.m. and from 3 p.m. to 4 p.m.
How much: $79, taxes and service fees included, for a group of 2 to 4 people. · hot chocolate at will.